So go the haunting lines of the ballad popularized by Brad Paisley in the TV series Raylan. But we have proof that the legend is not true. When Associate Member Doug Brock told the Chapter Registrar that his patriot ancestor was Jesse Brock, the first thought was “I’ve heard that name before”. The reason being, Associate Member Bill Thompson is also a descendant of Jesse Brock, who resided in Harlan County. 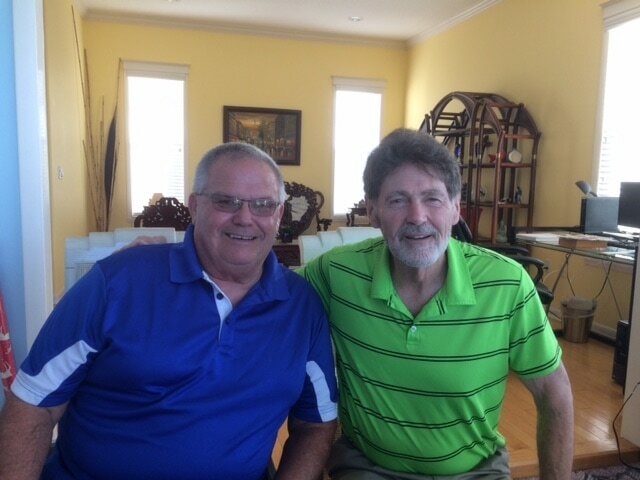 While both Bill and Doug reside in Hernando County, and are third cousins, they met for the first time at our Withlacoochee Chapter SAR meeting. Doug’s family remained in Kentucky and the Cincinnati area, while Bill's family headed west, with stops in Kansas, and Colorado, before settling in the Portland, Oregon area. The applications of both Bill Thompson and Doug Brock have been approved at the state level and are awaiting National approval. And for Bill, that is with the help of another cousin he had never met who resides in Hernando County—Otto Coldiron, who authored a book on the Coldiron family which provided the link necessary to prove descent from Jesse Coldiron, grandson of Jesse Brock. Jesse Brock was born in Cumberland, Virginia, and served as a private in the North Carolina line. According to “Early Families of Eastern and Southeastern Kentucky”, his declaration for a pension filed October 16, 1833, in the Harlan Circuit Court, states that he enlisted at Guilford Court House, Guilford County, NC (the year not remembered), for a term of three months in the North Carolina State Line, and served under General Martin, Colonel Martin, and Captain Roylston. He again enlisted at Guilford Courthouse for a term of three months during which enlistment he with other soldiers of his organization were detailed and marched and guarded wagoners (sic) and their wagons laden with provisions for the American Army stationed at Chartell (?) Court House, South Carolina. He enlisted for a third time February, 1781 in Surry County, NC, for a term of three months and served under Captain William Underwood, Lieutenant Porter and Ensign Richard Taliaferro. They joined Colonel Thompson’s regiment of the North Carolina State Line and subsequently he was in skirmishes with British and Tories at Albemarle Creek and White’s Mills, a few days before the Battle of Guilford Court House (March 15, 1781). He relocated to Harlan County, Kentucky about 1797-98 and died there in 13 Oct 1843. We are pleased that Doug Brock and Bill Thompson made the journey from Harlan to Florida, and welcome them into the Withlacoochee Chapter FLSSAR. Copyright © 2018 Withlacoochee Chapter Sons of the American Revolution. All rights reserved. Please contact Webmaster Ken Dunn at kendunn@tampabay.rr.com with problems or questions concerning our web site.